This package amounts to some of the most extreme ‘free market’ fundamentalism we’ve ever witnessed – even by the standards of the International Monetary Fund programmes imposed on Africa, Asia and Latin America in the 1980s. In short, it says that Greece is up for sale, and its workers, farmers and small businesses will have to be cleared out of the way. The purpose of the bailout has little to do with ‘repaying debt’ and everything to do with creating a corporate paradise in the Mediterranean. The debts that matter to Europe’s elite have already been repaid. Today, debt has simply become a straightjacket to discipline Greek society. The real purpose of the programme is economic restructuring, through privatisation and deregulation. 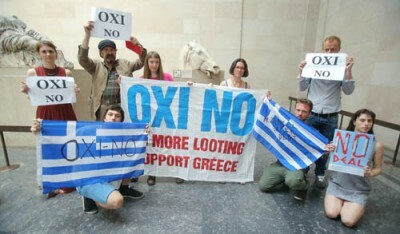 Under the terms of the ‘bailout’, Greece is ‘up for sale’. From the national lottery to the port of Pireaus to swathes of Corfu, corporations are scrambling to get a piece of the action. The package declares war on all who stand to lose: workers, small businesses and farmers. Gone will be laws protecting small business ownership, collective bargaining, the minimum wage, and help for farmers. The reforms are so specific that the EU is writing regulation on bread measurement and milk expiry dates. No doubt Greece’s economy needs reform. That’s what Syriza was elected to undertake. But what is being imposed is the establishment and micromanagement of radical ‘free market’ economics, far more extreme than exist in many of Greece’s ‘creditor’ countries. This is not a solution to Greece’s debt crisis, but a solution to the profits of European capital.